In the first installment of this two-part blog series, we discussed the goals and benefits of telestroke technology—what it is, how it is used, why it matters, etc. However, telestroke programs need to be implemented along with the proper tools and infrastructure/support in order for them to be truly effective. In this second and final installment, we will be looking at both the basics of telestroke systems as well as some of the amazing telestroke technology that healthcare providers are using to save the lives (and brains) of stroke victims. The basic arrangement of any telestroke system begins with establishing a secure but efficient method of video/audio communication that links the facility/patient to the attending neurologist. 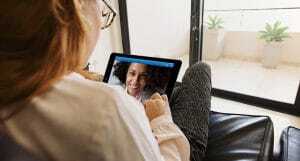 As its foundation, any telestroke program must be equipped with reliable and high-speed internet that is capable of handling the kind of high-resolution, real-time video conferencing solutions that make it possible for the neurologist, nursing staff, and patient to communicate clearly and without interruption. After all, the entire point of implementing a telestroke system is to allow the attending neurologist to remotely evaluate the patient—symptoms and severity, remote viewing of CT scans, observe motor skills/function, etc.—in order to expedite diagnosis and delivery of treatment. Considering that there is only a three hour window for administering treatment after a stroke, time is the most critical factor. After that three hour window expires, the odds of patient recovery plummet significantly. According to one study, stroke victims who were treated with anti-clot drugs within the first ninety minutes had a nearly 250% better chance of recovery after three months (when compared to patients who did not receive treatment within three hours). This means that a having a properly equipped telestroke system is crucial to its success. Telestroke/Telemedicine Carts: These “carts” are actually mobile communication units equipped with everything a neurologist needs to administer remote care—internet capability, high resolution cameras, microphones, multiple viewing screens, and more. Telestroke/Telehealth Software:To put it simply, these apps are what makes the remote use of telestroke hardware (telemedicine carts) possible. 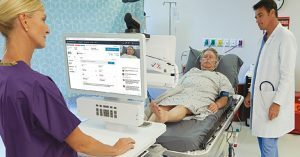 The neurologist can remotely connect to the cart via a secure, HIPAA-compliant software and apps that allows him or her (using and computer, laptop or mobile device) to speak with/observe/evaluate the patient, view CT scans, give instructions to nursing staff, etc. 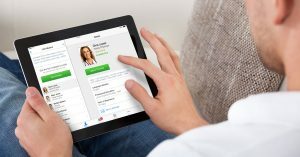 Mobile telestroke apps have untethered stroke care providers from desktop computers, allowing them to deliver nearly immediate care from anywhere and at any time.